Feb. 4 2015: Below is a 10 minute breakdown of the current status of Piano Around the World and Dotan Negrin. I quit my 9-5 job back in 2010 to go after what I love. I was miserable in New York city. Working a 9-5 as a personal assistant. Doing what people told me to do. Every day i would think of all the things I would do if I didnt need to have that 9-5. And then one day... I Quit. I took all the money in my savings account, bought a 12 foot box truck and a piano and hit the road. The idea behind the trip was to live entirely off my passions which are: Music and Travel. I lived out of my box truck "studio apartment" for 5 months as I traveled to more than 35 states meeting people from all over the world. I paid for everything by wheeling my upright piano onto the streets and playing for the thousands! Sometimes people would invite me to their homes to have dinner. Other times I met stellar musicians who wanted to jam. I even got robbed by a drug addict. The few low moments I've had in the last 3 years were some of the lowest moments of my life. But the high moments were beyond extraordinary. Both shaped me into the person I am today. I spent many hours on the road by myself questioning my life path and where I am going. A lot of the times I didnt know where I was going. Life is more fun when you dont know what happens next. Since 2010 I have traveled to more than 24 countries in the last 4 years and literally met more than 10,000 people from all over the world. I drove to Costa Rica from New York City, with a piano in my van in 2013. I took more risks and experienced things than most people have ever experience in a lifetime. And there is no way I am stopping now. My fanbase is dedicated and loyal. I speak to many of the people that follow me and I even skype with the ones who I am closest with. I believe my biggest issue with social networking has been branding and choosing a main focus. Because what I do encompasses a variety of things like Music, Travel, and People, I have had difficulty in creating a simple model for what I do. Hence why I am working in this moment with some branding/marketing people. Things will be considerably different by March 1, 2015. I post EPIC photos of my travels and of pianos in really cool places. I also love to engage with my fans on here. When I travel to new places, I sometimes meet up with many Instagrammers. 1 video has 200,000 views. Started Posting videos in June 2014. I'm looking to put a lot of my eggs into the Youtube basket this year since I am trying to pitch a TV show and focus more on video. 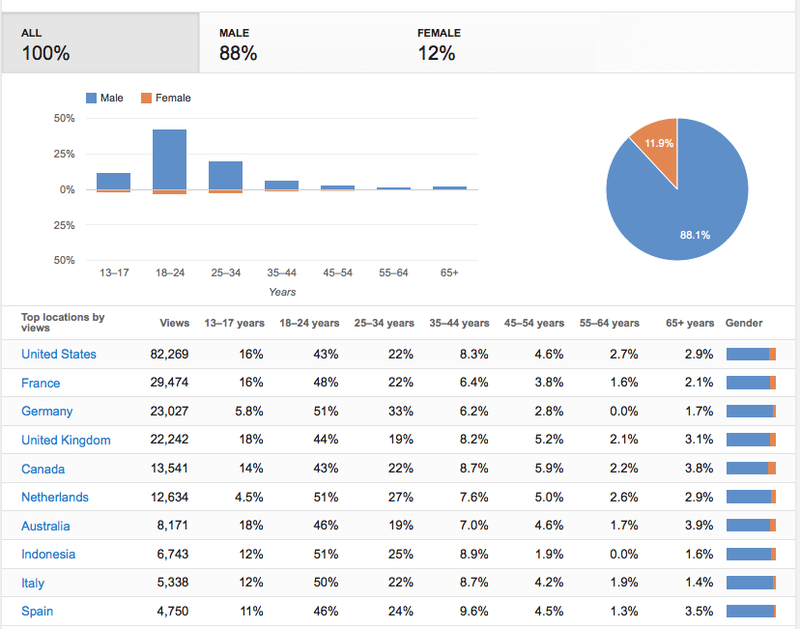 Things are looking good and there is increasing demand judging by analytics. I get about 25 subscribers a day on average. In the Analysis section you will learn a little about the viral marketing campaign that we are working on to increase these numbers exponentially. I know what has to be done. There is much more to be discussed here. Below is a video from playing piano at the Eiffel tower that has gotten almost 200,000 views. I filmed, starred, and edited the video myself with a little help from my past girlfriend. I had good relations with the people of Tumblr back in 2012. They invited me to their office and I brought a piano to play for one of their Friday afternoon office party. My Tumblr also needs a new design and rebranding to bring all the best and newest content to the top and of course guide people back to my web site. My blog is currently undergoing a facelift, so please pardon the construction. I am working with my team to set up a better, more organized strategy of releasing new and unreleased content as well as cutting the fat and creating a simpler brand identity on the internet. I have made TV appearances in more than 15 countries with multiple in the USA, Australia, Italy, France, Germany, Argentina, Mexico, and a handful of other countries. Below is a commercial I did in 2013 with Goodyear Latin America that appeared all over Latin America. They took my life and put it into a commercial. Rather than just looking at the numbers, its important to also look at the potential of where this can go and how fast I am growing. At the moment, I am working with a marketing/branding strategist to create a long term plan to improve my brand and image. We are also working on a viral video marketing campaign using new and unreleased video footage from the last 3 years of traveling around the world with an upright piano. My 2 biggest problems in the last few years has been juggling every role of my operations by myself while not having enough time to focus my energy on the creative side. This includes having a surplus of great video and audio footage that hasnt been released. Also my brand image needs to be simplified and consistent throughout the internet. I have recognized these problems and am working on addressing them. If you look at the amount of TV appearances I've done around the world, commercials, endorsements, and places I've been, I believe what I have done is rather impressive considering I have done all of this BY MYSELF without a manager/agent. I just finished 2 weeks of filming in Buenos Aires with 2 producers and a cinematographer to create a pitch for a TV series about music around the world. Think of Anthony Bourdain: No Reservations, but about Music and musicians from around the world with Dotan Negrin as the host. We would be how traditional music of different regions of the world mixed with modern styles of music. It would be low budget, Guerilla style, "reality" filming. We should have a 3 minute teaser within the first 2 weeks of February. If all is successful with the Argentina videos, we will re-create the same thing in Cartegena, Colombia in April 2015 and try to convince Goodyear Latin America to join in on the production. I also have a previous sponsor from South Korea: Gentlemonster.com and we are looking to collaborate on doing a mini Piano tour in Seoul and maybe other parts of Korea in May 2015. I have recognized Korea as an incredible market for me as a pianist, but not just any pianist: a New Yorker who travels around the world and plays an upright piano on the streets! This could potentially be a gold mine of opportunity for me as a musician. My chips are all on the table and I will continue hustling until something sticks. I have invested my life into doing what I love, inspiring people around the world, and fighting to become financially independent from my passions.... and I would love to have you join me!